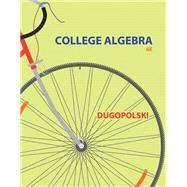 With an emphasis on problem solving and critical thinking, Mark Dugopolski’s College Algebra, Sixth Edition gives students the essential strategies to help them develop the comprehension and confidence they need to be successful in this course. Students will find carefully placed learning aids and review tools to help them do the math. Mark Dugopolski was born in Menominee, Michigan. After receiving a BS from Michigan State University, he taught high school in Illinois for four years. He received an MS in mathematics from Northern Illinois University at DeKalb. He then received a PhD in the area of topology and an MS in statistics from the University of Illinois at Champaign—Urbana. Mark taught mathematics at Southeastern Louisiana University in Hammond for twenty-five years and now holds the rank of Professor Emeritus of Mathematics. He has been writing textbooks since 1988. He is married and has two daughters. In his spare time he enjoys tennis, jogging, bicycling, fishing, kayaking, gardening, bridge, and motorcycling.